"...a work of art as well as a manual...an inspiration." --ForeWord Magazine. Get where you want to go...in style, on an attractively laid out path or walkway that blends beauty and utility. Whether you desire a captivating stepping-stone path winding through garden gates; a classic brick walk leading guests up to your front door; or gravelworks paving a gently sloping site, all the confusing wheres and hows of designing, choosing a material, and putting down a base are cleared away. Brimful of magnificent photos (including a gallery) and instructions that literally lay out every step of the process, this guide alerts you to some easy-to-miss practicalities right from the start--reminding you, for example, sharp gravel will hurt the tender feet of any barefoot children running around or brick or concrete will make handling a stroller or wheelchair much simpler. Try ornamental stone, grass, pine needles, concrete--personalized with embedded shells or writing, elegant cut stone, intriguingly shaped natural stone, versatile and (if you want) colorful brick--each lovelier than the last. This book gives you all the ideas there are for making a walk or path then walks you through how to do the path!! My wife and I found a path we loved and with some digging, with some sand and landscape fabric we laid 16 x24 gray stone patterned patio blocks about 9 inches apart to the front door and to the family room. Connecting the 2 paths with 10 more blocks. After putting down landscape stone with pea gravel between patio blocks we now have a beautiful walk but have added curb appeal to our house!!! This is a very good book!! We have lived in this house for 20 years without a front and side walk just grass and this book got me motivated to do a walk!!! What a beautiful difference this book did for us!! 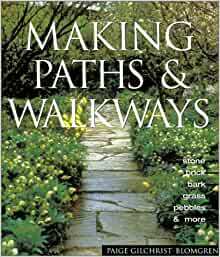 Outstanding book on paths and walkways.